Preheat a non-stick frying pan or sandwich press. Top four of the tortillas with the chili beans, corn, chopped tomato, spring onion and grated cheese. Cover with the remaining tortillas to make a tortilla sandwich. 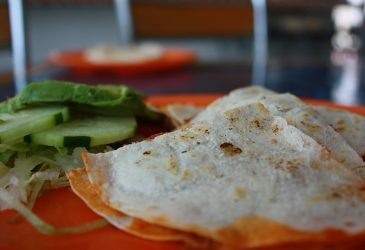 Cook the tortillas one at a time in frying pan. Cook on one side for 2-3 minutes, then turn with a spatula and cook for another 2-3 minutes until fillings are hot and the cheese has melted. Repeat with the other tortillas. Cut each tortilla into four wedges. Eat and enjoy!